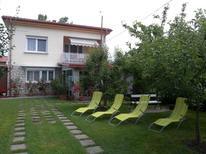 You can enjoy the view of Lake Balaton directly from the pool of this holiday home. Hungary | Hungary’s dry and mild steppe climate is worth a trip at any time. But if it should get a bit too hot, your own pool is the perfect complement. Former palace for 30 people at Lake Balaton. A customer left a feedback for this cottage for 6 persons at Lake Balaton: "it's a very beautiful, superb house which I can truly recommend." 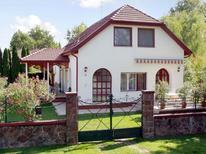 Hungary | Great holiday for not much money? No problem. Here we offer you a selection of holiday apartments and houses that are not expensive and at the same time have been rated very good by other travellers. A holiday house at Lake Balaton costs on average GBP 246 in the cheap travel period and GBP 725 in the peak season per week. These details are of course in relation to the house and not per person as well as includes the obligatory additional charges. Lake Balaton is Hungary's largest lake and a popular destination. 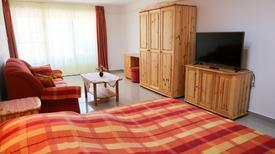 A vacation in a holiday home by Lake Balaton gives visitors the flexibility to explore the lake and surrounding area. 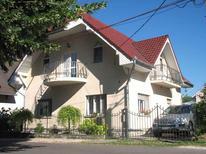 It is easy to rent and book holiday houses at Lake Balaton. Lake Balaton, also called the Hungarian Sea, is fifty miles of warm green water. Visitors to Lake Balaton are all about waterssports. The southern end of the lake is more popular with families because of the sandy beaches and shallower water. The northern end is considerably deeper and drops off sharply making it ideal for lake kayaking and boating sports. With holiday homes visitors can spend the day swimming and boating and then come back to the holiday homes for an evening with friends or family. The lake is surrounded by green countryside full of little villages and vineyards. If visitors don't feel like cooking at their holiday rentals visitors can enjoy exploring the Hungarian villages, many of which have excellent dining options and fine wines from the nearby vineyards. 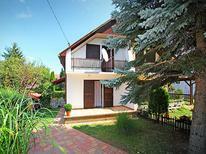 Siofok is the main town on the southern bank and is known for being a bit of a party town with great night life. If visitors are interested in history they should be sure to check out Keszthely the oldest settlement on Lake Balaton, which was a major economic hub during the Roman Empire and home to the Festetics Mansion. 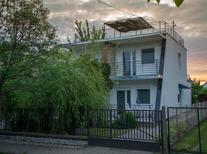 Visitors with holiday apartments in this area of Lake Balaton will have easy access to both the historical sites and the lake. With the great water sports, the lakes idyllic scenery and the comforts of holiday apartments or holiday houses a trip to Lake Balaton is a vacation to remember.